Hawaii’s Coral Reefs “In Crisis” – Neptune 911! Dr. Work, head of infectious disease for USGS, has been diving at several locations along Kauai’s North Shore with Don Heacock, Kauai district aquatic biologist for the Department of Land and Natural Resources’ Division of Aquatic Resources, and Terry Lilley, Hanalei-based diver and biologist. Terry Lilley placed photos and videos of the progress of the coral disease on the website, Hawaiian White Coral Disease – Hawaii Reefs in Crisis. Dr. Work stated the reefs are dying to reporter, Chris D’Angelo of the “Garden Island News,” April 19,2013. 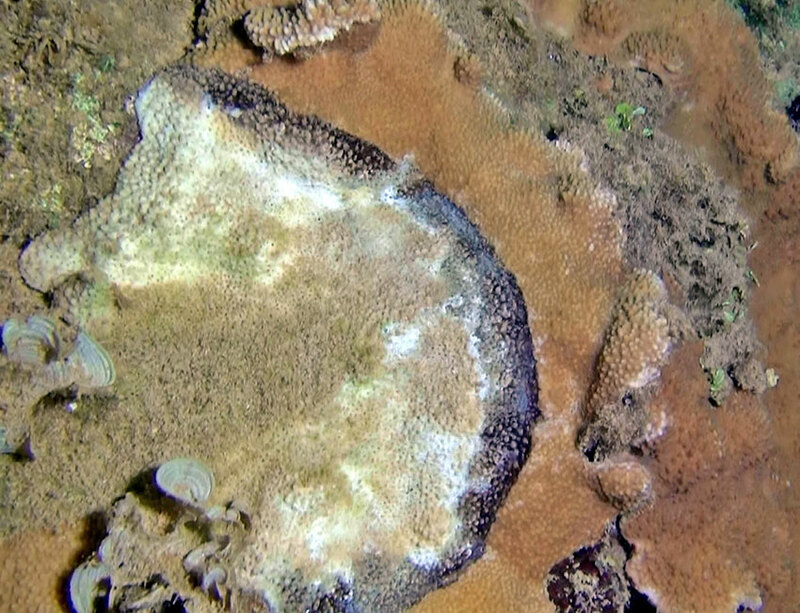 In his report, D’Angelo stated that the coral are experiencing an outbreak of a deadly coral disease that consists of three different bacteria working together which may be targeting more than one species of Montipora coral. Don Heacock stated this disease is the first he has seen in his 31 years as an aquatic biologist. The coral are a fragile ecosystem forming the reefs that become the habitats of thousands of fish and other marine life. By growing to shape the bottom contour of the ocean, the reefs also function to form the waves coming towards shore. The coral reefs also protect the land and shore from erosion by larger wave action. 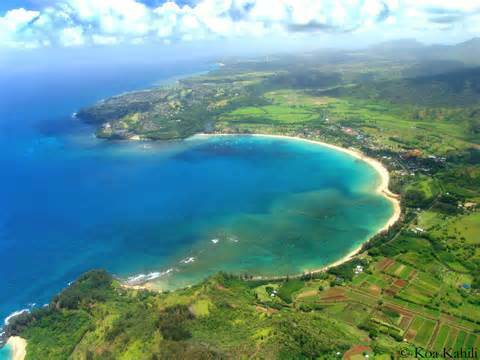 Historically, Hanalei Bay has been known as one of the longest surf breaks. However, Terry Lilley stated in an email to us that he believes the ride is about half as long as it once was due to the dying coral. Another cause of stresses to the fragile coral could be the repeated hits of pressure waves created by the U S Navy sonar exercises near Hanalei Bay. Whales have repeatedly been stranded in the Halalei Bay when the Navy performs sonar exercises. The Natural Resources Defense Council (NDRC) documents the incidents in 2004, 2006, 2008 and explains how lethal sounds harm and kill whales and other mammals. A team of scientists from NOAA is joining the researchers in Kauai. D’Angelo reported the team will stay into May and will be led by coral disease specialist Bernardo Vargas-Angel. The team will augment previous efforts started last year by both USGS and UH. D’Angelo reported that Dr. Work said the east side of Hanalei Bay (Waipa) is the most affected by the disease and the area is littered with the white skeletons of dead coral colonies. Both Dr. Work and Dr. Greta Aeby have been studying the coral disease since September 2012. Dr. Work stated the amount of sediment in the water there as “horrible.” Dr. Work said that Kauai’s reefs are trying to tell us something and the community should be listening. He said much can be done to address local problems, including land-based pollution and overfishing. Despite sweeping protections put in place near the end of George W. Bush‘s presidency for large swaths of marine ecosystems around the Hawaiian Islands, things are not looking good for Hawaii’s coral reefs. Poisonous run-off, rising ocean levels, increasingly acidic waters and overfishing are taking their toll on the reefs and the marine life they support. Biologists are trying to remain optimistic that there is still time to turn things around, but new threats to Hawaii’s corals are only aggravating the situation. To wit, a previously undocumented cyanobacterial fungus that grows through photosynthesis is spreading by as much as three inches per week on corals along the otherwise pristine North Shore of Kauai. “There is nowhere we know of in the entire world where an entire reef system for 60 miles has been compromised in one fell swoop,” biologist Terry Lilley told The Los Angeles Times. “This bacteria has been killing some of these 50- to 100-year-old corals in less than eight weeks.” He adds that the strange green fungus affects upwards of 5 percent of the corals in famed Hanalei Bay and up to 40 percent of the coral in nearby Anini Bay, with neighboring areas “just as bad, if not worse.” Lilly worries that the entire reef system surrounding Kauai may be losing its ability to fend off pathogens. Meanwhile, some 60 miles to the east across the blue Pacific, an invasive algae introduced for aquaculture three decades ago in Oahu’s Kāne`ohe Bay is also spreading quickly. Biologists are concerned because it forms thick tangled mats that soak up oxygen in the water needed by other plants and animals, in turn converting coral reefs there into smothering wastelands. “This and other invasive algal species … don’t belong in Hawaii,” said Eric Conklin, Hawaii director of marine services for The Nature Conservancy, which works to protect ecologically important lands and waters worldwide. He adds that there are not enough plant-eating fish to keep them under control. Biologists are working hard to battle the algae in and around Kāne`ohe Bay. Conklin and his colleagues from the conservancy have joined forces with researchers from the state of Hawaii to develop an inexpensive new technology, dubbed the Super Sucker, which uses barge-based hoses and pumps to vacuum the invasive algae away without disturbing the underlying coral. Once divers clear a given reef of algae, they then stock it with native sea urchins raised in the state’s marine lab that can help keep new algal outbreaks in check. The system has been so successful at reducing invasive algae at Kāne`ohe Bay that the state has begun producing tens of thousands of sea urchins for similar “outplanting” projects on other coral reefs around Oahu and beyond that are threatened by invasive algae.